Ángel Martín Bandera was born in Málaga in 1976. His interest for music started at a very early age although he would begin his formal music studies after obtaining his bachelor’s degree in engineering. He began studying traverse flute in 1998. However, his passion for music from «other worlds» constituted an awakening initially characterized by a deep interest in African percussion, which lead him to an investigation experience in Burkina Faso in 2000. In 2002, during a three-year period living in Italy, Ángel combined his flute studies in Arrigo Boito Conservatory of Music in Parma with the deep research on wind & percussion instruments present in cultures all around the world. 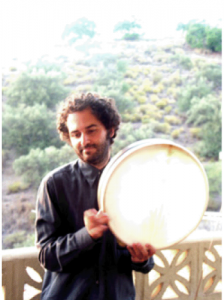 Back to Málaga in 2005, his flute studies continued with Keiko Takehuchi and he began his autodidactic studies on frame drums (mainly riq & tar). Since then, he has attended several workshops on frame drums and has continued his research on this type of percussion. One of his most renowned teachers has been Ricardo Passos. Ángel has worked as a therapist and facilitator for different projects and associations in Málaga (Spain), La Paz (Bolivia) and Cremona and Parma (Italy). As a flutist & percussionist he has worked and performed with bands of various music styles (rock, folk, traditional music) such as: Khairkan, El Sombrero del Alquimista, Userne or Mokambo, with whom he has performed in Spain, Italy and Latin America.